Cinco de Mayo is sometimes mistaken for Mexico's Independence Day—the most important national holiday in Mexico—which is celebrated on September 16, commemorating the Cry of Dolores, which initiated the war of Mexican independence from Spain. 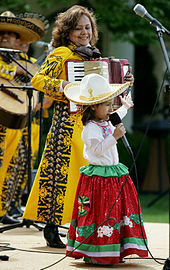 ^ "Why is Cinco de Mayo More Popular in America Than in Mexico?". US News & World Report. Retrieved May 5, 2018. ^ Robert L. Bidwell (April 1971). "The Political Evolution of the Mexican People. By Justo Sierra. Translated by Charles Ramsdell. Austin, TX: The University of Texas Press. 1969". Journal of Interamerican Studies and World Affairs. Center for Latin American Studies at the University of Miami. 13 (2): 306–308. JSTOR 174689. ^ "What Is Cinco de Mayo?". The New York Times. May 5, 2018. Retrieved May 6, 2018. This page was last edited on 24 April 2019, at 03:26 (UTC).